Everyone loves live music at any event and there is something spectacularly wonderful about watching and hearing a Harpist at work! The instrument itself is beautiful, and the sound is delicate, pure and very versatile. A great Harpist will have a wide ranging repertoire of classical and contemporary music - so whether you want Disney Themes or Dvorák - your chosen Harpist can create a play list that will reflect your favourites and charm your guests. It's an alternative and exciting musical choice, so for a memorable party, go for gold with magical harp playing! Find a Harpist for hire near you in minutes! Option 1. Enter your event location below & contact a Harpist directly! Option 2. Request multiple quotes from available Harpists Get Quotes! Option 3. 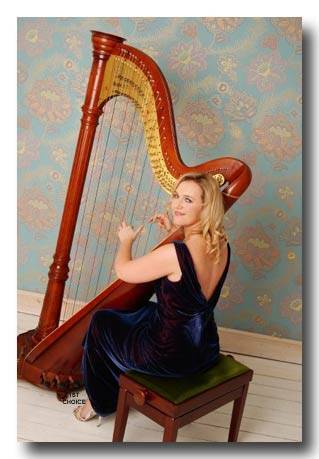 Read information & advice on hiring Harpists Read Advice! WANT TO KNOW MORE ABOUT HARPISTS? Read on for the most comprehensive guide to booking a Harpists, including how much a Harpist costs, exactly what they will do at your event, plus tips, advice and information to help make your event one to remember! A Harpist will pluck and strum that heavenly sound until everyone in the crowd is captivated. When you hire a Harp Player, it will really add a touch of class and sophistication to your event that you will rarely get with any other form of entertainment. What exactly will a Harpist do at your event? A harp is considered an instrument which is rarely seen live so when we do see one at a gig, wine bar or wedding, the beautiful sweeping sounds radiating from it is genuinely magical and captivating for everyone. Once the Harp Player is set up in the function room/church, you can expect to be relaxed, entranced, entertained and moved by the plucked and strummed glorious strings. The hired Harp Player will have a repertoire that will cover well known classical pieces by the world’s most famous composers including: Bach, Beethoven, Handel, Mozart, Schubert and Vivaldi. They can even slip in a few modern hits with a classical harp make-over! Mainly, a Harpist will entertain your audience with a fantastic live show that will put the wow factor into celebrations and impress your guests, whatever their entertainment tastes may be. What event types are Harpists hired for? As previously mentioned, a wedding ceremony would be one of the best occasions in which to hire a Harpist due to the romantic and majestic sounds associated with it. The Harpist will play as your guests enter the venue (be it a church or a registry office) and then they can play as the bride enters. (Imagine Wagner’s ‘Wedding March’ being plucked out on the harp as the happy bride is walking down the aisle!) The Harpist can play as the bride and groom sign the register and as the newlyweds leave the venue, they can continue charming and wooing as the guests leave. So, the happily married couple have just got hitched and they are now posing for photographs whilst family and friends are sipping on those first precious glasses of champagne! How do you keep everyone entertained but also not distracted? By hiring a Wedding Harpist of course! A Harp Player can be set up almost anywhere in your venue so having this beautiful, sweeping and angelic music played live by a professional musician is the perfect form of soft entertainment. How do you fill those gaps in-between events at your wedding? Well, by hiring a Harpist! As the gentle live music fills and reverberates through the dining hall, your guests can start to relax and unwind, all the while socialising with no issues hearing each other! A Harpist is the ideal instrument to make everybody comfortable just before the speeches. 'Why should I hire a Harpist?' You may be asking. 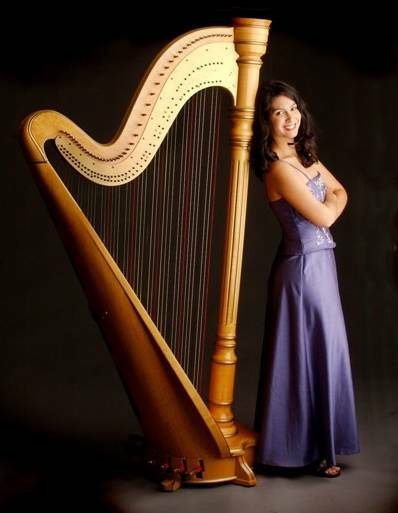 The main reason is the class and elegance that booking a professional Harpist will bring to your event. Carry on like you started and keep your entertainment cultivated and tasteful by setting up the hired Harp Player in the corner of your main hall or reception venue. A harp will create wonder in the childrens imaginations whilst creating admiration with the adults. Also, set-lists can be tailored to suit all of your friends and family requirements. It’s important to add that a Harp is a stand alone instrument and can moved around from venue to venue with a relative amount of ease. Alternatively, if you would like to create a unique experience for your co-workers, employees and clients, then you may want to book a Harpist for your corporate event. Whether it’s a trade show or an annual work-do, a Harpist will relax all of your guests straight away, so there will be less of those awkward moments which sometimes occur at these business events! Let’s not forget (as previously mentioned) that a Harp Player can also tailor their setlist’s to pluck pop songs from their harp. Hearing well known hits being translated to the beautiful harp sound is an absolute joy! You can request songs and tailored setlist’s by using the entertainersworldwide.com personal messaging service, which is very easy to use! What better way to kick-start your product or open your shop than to hire a professional Harp Player! Due to the sensitivity and spirituality of the occasion, a private birthday or a Christening is another perfect occasion in which to hire a Harp Player. 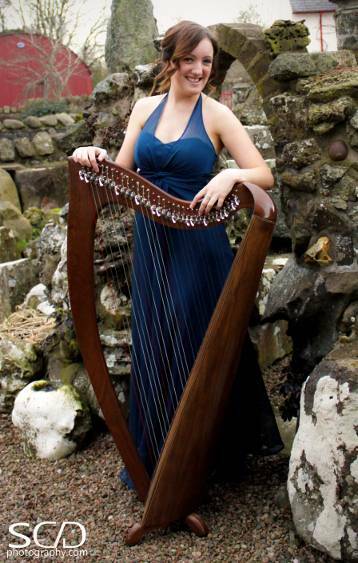 Ritzy and suave, a Harp Player will have the whole crowd talking long after the event! Rare things are special and because the Harp is so unique, the Harp would bring that extra bit of panache to proceedings! How much do Harp Players cost to hire? Our simple to use entertainment directory allows you to firstly search for the best Harpists who are local (or travel to your area) and then via the contact form you may contact them directly to enquire for a no obligation quote to perform at your event. Some acts will also add a rough price guide to their profile for your convenience. What are the usual set formats and performance length for Harp Players? A Harpist can tailor their performance to times that will suit you and your event, however, on average a professional Harp Player will strum and pluck for two 45 minutes sets. How much space will a Harp Player need at your event? A Harp Player will not require too much room at all. A professional concert Harpist will require roughly 3m x 5m in area space to perform comfortably. What equipment and set up requirements do Harp Players need? As with most artists signs up on Entertainersworldwide.com, a Harpist will provide most of their own equipment. This may include: The harp, sheet music and a stool to sit on. You may wasn’t to enquire if an artist needs a PA to amplify their sound, in which case we would advise to use our easy to use messaging service to find out. How can you find and book a Harp Player with Entertainersworldwide.com? WANT TO RECEIVE A RANGE OF QUOTES FROM Harpists?